Filipina-Canadian Cindy Lapeña recently released her first novel, The Lost Amulets, online through Amazon and CreateSpace in both paperback and digital versions. The novel is an exciting and masterful fantasy written for young adults but sure to appeal to all ages, in the same way J.K. Rowling’s Harry Potter series did. Already, she is being compared to best-selling authors Lloyd Alexander and Cornelia Funke. The Lost Amulets is the story of four teenagers who are drawn into the magical world of Dapit-adlaw, where mythological and supernatural beings live. They join a party of Littlefolk and Otherfolk, consisting of dwarves, elves, gnomes, and a kapre to seek lost amulets that are instrumental in the controlling natural elements so that they can restore some balance to nature. Their adventure takes them all over the islands of Dapit-adlaw, where they encounter other supernatural beings and mythical creatures, including aswang, sigbin, buwaya, siyokoy, kataw, and more. 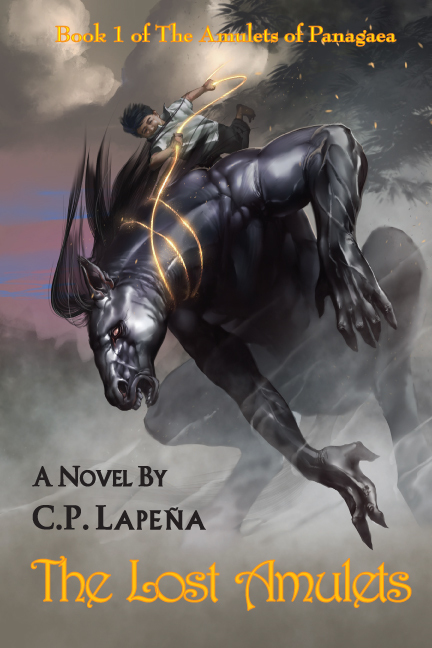 What makes The Lost Amulets an important and significant addition to the corpus of Philippine and World Literature is how it integrates classical and ancient Philippine myths into an urban fantasy adventure. It introduces a vital aspect of Philippine culture to the world and presents it in a thoroughly enjoyable manner. It is a refreshingly new concept that is more than welcome as it provides a unique replacement for the tiresome vampires, zombies, and werewolves that are the current mainstay of urban fantasies. The Lost Amulets is the first book in Cindy’s upcoming trilogy, The Amulets of Panagaea. Besides being a first-time novelist, Cindy Lapeña is also a past-winner of the prestigious Carlos Palanca National Awards for Literature. She received the 3rd place award for a full-length play in English in 2007, her first entry to the annual Awards. She is the author of the reference series 101 Fun Games, Activities, and Projects for English Classes (also available on Amazon and CreateSpace), which draws on her extensive experience as an English teacher and training consultant in the Philippines. She currently resides in Prince Edward Island, Canada, where she is an arts and teaching consultant, a practicing artist and writer, and owner of Art ‘n’ Words Studio & Gallery. This entry was posted in The Lost Amulets and tagged amazon, Art 'n' Words Studio & Gallery, artists and writers, aswang, books, Canadian authors, Cornelia Funke, CreateSpace, Dapit-adlaw, duende, dwarves, ebooks, elves, fantasy, fantasy adventure, fantasy literature, Filipino authors, Filipino-Canadian authors, folklore, folklore in contemporary literature, gnomes, Harry Potter, kapre, kataw, legends in literature, Littlefolk, Lloyd Alexander, mythology, mythology in literature, new book, new novelist, Palanca Awards, PEI authors, Philippine authors, Philippine literature, Philippine writers, Philippines in literature, sigbin, siyokoy, supernatural, supernatural in literature, The Amulets of Panagaea, The Lost Amulets, urban fantasy, YA fantasy, YA fiction. Bookmark the permalink.